Ramona Mitrica is director of Profusion Publishers, through which she brings Romanian authors on the English-speaking book market. She started out in cultural entrepreneurship after many years of being close to this phenomenon in the UK. 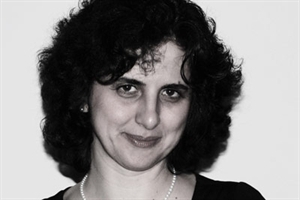 She came to London in 1999, as the cultural attaché of the Embassy of Romania to the UK. In 2002, Ramona became the director of the Romanian Cultural Centre and the Ratiu Foundation in London – two independent British organisations. In 2008 she created Profusion International, her own artistic consultancy firm, and in 2011 she launched her private publishing house: Profusion Publishers, an independent British company. You are living in London and you are working intensely for the benefit of Romanian culture and especially of Romanian literature. I’ve been living in London for more than 12 years now and my work was connected, from the very start, to promoting Romanian culture in the UK. It is not just “a job” – it is a passion: after al these years I am still working in this sector. The British cultural scene is vibrant, very competitive. Prestigious companies and organisations with a tradition in the promotion of culture, but also young independent organisations, entrepreneurs, national and international cultural institutes are working continuously in order to capture the public’s attention. If you want to stand out in such a landscape, you have to focus on bringing over a new element which can surprise the audience you choose to address. I believe that my most important accomplishment was to succeed in interesting British cultural operators in Romanian products, so that the request for the so-called “cultural exports” would be initiated by the British partners. To this end, I started and maintained collaborations with film distributors such as Artificial Eye, Trinity or Soda Pictures, with Curzon Cinemas (the partners of the Romanian Film Festival in London), with university chairs and schools such as the theatre department of London Southbank University or the literature departments of Goldsmiths College and the University of Leeds. Maybe the most courageous step I took in relation to promoting Romanian literature was to establish, together with British author Mike Phillips, our own publishing house, Profusion, which translates and publishes works from the Eastern European area. Due to the huge popularity enjoyed by crime writing in the UK, we decided – after thorough research – to establish the Profusion Crime Series. We selected works we believe to be representative for the “noir” trend in Romanian literature. We started with “Attack in the Library” by George Arion, a book from 1983 which is considered by the critics as a cornerstone of Romanian crime writing. The second book is “Kill the General” by Bogdan Hrib, published in Romania at the beginning of 2011. Both translations were launched in the UK at the end of November 2011. The following two books, which will be published soon, are “Anatomical Clues” by Oana Stoica-Mujea, a debut crime novel with a heroine who is atypical for the genre in Romania, and “Rîmaru – Butcher of Bucharest”, a true crime story by Mike Phillips and Stejărel Olaru about the serial killer active in 1970-71. Through the books we publish we wish to transmit to the audience the fact that the Romanians, even if they live in a different society and in different conditions, can go through the same existential problems as the British and can react in the same way – both in ordinary and extraordinary situations. At times, Romania’s image in the UK can be rather simplistic, and we wanted in fact to try and change an attitude. We don’t want to be seen as some exotic foreigners coming from Bram Stoker’s Transylvania. Translating colloquial Romanian – a language full of humour, allusions and specific expressions – into English was as difficult as it was satisfying in the end: a challenge. We tried to keep the original style and tone, using good, grammatically correct English that would not “naturalise” the characters and make them sound like East End cockneys. We started with a rough translation and then refined the text, adding explanatory notes along the way which would give the reader as true as possible an image of the times and locations where the actions take place. How is Romanian literature seen from the UK? With the risk of attracting critical comments, I have to say that our literature is not as well known as it truly deserves in the Anglo-Saxon space. Names like Emil Cioran, Mircea Eliade, Mihail Sebastian or Marin Sorescu are known to a certain segment of the public, but we are talking about an upper and relatively closed echelon of readers. It is difficult for an author coming from outside the English-speaking world to enter and have success in the British book market, even in the cases of established writers promoted through the efforts of successful publishing industry names such as Penguin or Random House... Sometimes, it takes a Nobel in order to open the gates – as in the case of Herta Muller. Of course, there are authors from outside the English-speaking world who enjoy great success in the UK, like Orhan Pamuk, Umberto Eco or Gabriel Garcia Marquez, but these are exceptional cases – if we take the statistics into consideration. So when we decided to publish literature that comes from Romania, our idea was to try a different approach and address the audience through the means of popular culture. We believe the reader will be able to discover more easily a world which is different from his if this world is more accessible than the one presented, say, in a philosophical novel. Do you think Romanian authors have a chance to become more visible on the UK literary market? What about the US, keeping in mind the close connections between the two countries? Of course we believe that, otherwise we would not have started on this road, investing not only in translations but also in printing, distribution and advertising. We believe Romanian authors bring something extra, something that does not only come from their own talents, but also from the experience of being Romanian, of having lived in Romania in certain times and conditions. The visibility of Romanian authors in the UK is something that has to be built up with much patience and passion, as well as with a lot of confidence in the capacity of Romanian literature to say something to any audience. We also need lots of hope, but also a lot of hard, sustained work. As the English would say, “It is an act of faith”. The book markets in the UK and US are well connected, especially through the important publishing houses, so authors who are successful in the UK can reach the US market more easily, the reverse being also true. Even so, we cannot talk about a solution with guaranteed 100% success rate, as there are many factors that can influence the way in which an author or book will “travel” across the ocean. We have already established connections with academics, book distributors and literary agents in America and we hope that our discussions will lead to an even closer cooperation. Returning to the subject of Romanian authors’ visibility in the English speaking world, I would like to add that, through Profusion, we also established a special publishing project. We realised that, after so many years spent in the British cultural milieus, we have both the necessary know-how and relationships to connect Romanian authors and publishing houses or publications from Britain. That is why we wish to also act, in the future, as literary agents, but on smaller-scale. The project is still in its incipient phase, but, as a secondary direction, we created Academic Fellowship Publishers, through which we want to bring specialised literature from Romania (research, studies, doctoral dissertations, etc) to the English-speaking academic book market. We have already started negotiations with Romanian and British partners and are working on a publishing plan. How did you adapt to the London lifestyle? Having lived here for so long, I can say that I am well adapted to it. I have always been attracted to an active lifestyle which would enable me to do interesting things every day. London offers such an atmosphere that, if you truly want to do something, it is impossible to get bored. Being one of the great capitals of the world, both financially and culturally, there is always something to keep you going on in London. Are you familiar with the new books published in Romania? What do you like to read? I visit Romania often, on holiday and on business, and I have many friends working in the Romanian cultural landscape. Furthermore, being in this business, I have to be familiar with what is happening in Romanian arts and culture in general. I have pretty wide literary interests, and I read anything from Romanian crime novels to Mircea Cărtărescu and the works of the younger generation of authors such as Răzvan Rădulescu, Filip and Matei Florian, Adrian Urmanov or Vera Ion. I like good literature – I am afraid it would take far too much space to give an exact definition of what I understand by this term. How do you see Romania’s cultural presence in the UK ten years from now? My answer would be an optimistic one, based on what happened in the past ten years. This last decade was a period when Romania became a European partner of the UK, a period of time when artists, writers and cultural operators from Romania have had unprecedented access to international resources. I hope the next ten years would introduce Romanian literature in the British cultural market in the same way that Romanian film has become a byword for cinema of the highest quality.